Today's students are experiencing a rapidly changing world that is vastly different from that of their parents and grandparents. Cobbold (2005) argued that the increased instability in the economic and social global contexts will have implications, not just for employability, but also for the types of employment that will be in demand. It is estimated that approximately 40% of Australian jobs that exist today will be redundant in the next 15 years (Thompson, Hichens, & Hoyt, 2016). The challenge for educators is to develop each student’s ability to be a self-regulated learner. Indeed, as what Alan Toffler suggested in the 1980s is becoming more evident, that the “illiterate of the 21st century will not be those who cannot read and write, but those who cannot learn, unlearn, and relearn” (1983, p. 187). Today’s students need to be able to think critically, be creative, problem solve, and be able to work collaboratively and to be continually learning and relearning to be able to meet the challenges and opportunities of a rapidly changing world. This line of thought also transfers to businesses and commercial industries, that need to maintain their employees’ currency in specific knowledges and skills but also their capabilities with learning and relearning and an innovative mindset to maintain the competitive edge in a fast moving, internationalised economy. This report “A theoretical analysis of IMPACT: a learning framework for the online environment” (hereafter, the Report) was commissioned by the IMPACT Centre, a Queensland Government provider of online learning programs to thousands of students and educators across Queensland, Australia. IMPACT was strategically developed to enhance the outcomes and collective experiences of students, teachers, parents and the community, who learn in an online environment. There are six elements of IMPACT: Inspire, Model, Practise, Apply, Connect and Transform. Under each element are concepts and related strategies for effective teaching and learning in an online environment. This report provides an in-depth review of the theoretical underpinning of the IMPACT Learning Framework with regard to Child Development and Learning theories. Additionally, the report investigates the nature of learning in an online world and examines the framework’s position and validity as a pedagogical paradigm within an online learning context. It also begins to investigate the transferability of the framework to mainstream education and the wider commercial industry. The major finding of this report is that the IMPACT Learning Framework is a dynamic, valid and transferable instrument that contributes to effective online teaching and learning internationally. The IMPACT Learning Framework utilises a more integrated approach to research and practice around teaching and learning which has resulted in it having a focus beyond content and knowledge to include the metacognitive and individual needs and beliefs of students. Its fluid and dynamic paradigm empowers teachers to act as Learning Engineers taking a more in-situ role in building foundational knowledge and skills and challenge students to inquire, think critically, be creative, problem solve and work collaboratively. Its contemporary nature promotes technology-enabled learning (the effective and seamless use of digital technologies) and self-regulatory learning (learning guided by metacognition, strategic action and motivation to learn). 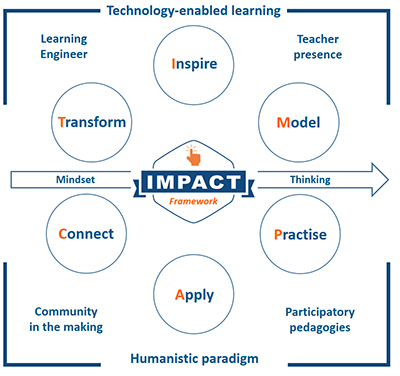 Its underpinning learning theories validate the framework and are reflected at multiple points within the six elements of IMPACT: Inspire, Model, Practise, Apply, Connect and Transform. Its transferability means that it should not be restricted to distance education, rather, it can and should be adapted to mainstream schooling, tertiary education and industry-based training. The IMPACT Learning Framework sits within a Humanistic paradigm activating high levels of interactivity and communication between instructor and learner; learner to learner; learner with content; and learner with digital tools and environment. The overarching goal of the IMPACT Learning Framework is for students and educators to develop mindsets that drive positive behaviours and lead to successful outcomes. Students’ positive attitudes are part of Carol Dweck’s growth mindset theory where students take responsibility for their learning and learning outcomes; attribute their success to their own efforts; have confidence in their ability and are persistent; and are able to be resilient when faced with challenges (Yeager & Dweck, 2012). Self-regulatory learning is the metacognitive awareness of one’s learning strengths and weaknesses. It is the ability to set up learning goals, to monitor their own learning process, to seek help when needed and to manage the time (Cazan 2014). It has a direct correlation to student achievement in online courses (Zimmerman & Schunk, 2001). It is recommended that the IMPACT Learning Framework’s fluid and dynamic paradigm be further investigated to explore how students and teachers use it across different contexts. An initial diagnosis of appropriation by IMPACT Centre teachers and distance education teachers is required as baseline data in an online education context. Following this, mainstream classroom adaptation and industry trials should be investigated. It is also recommended that the IMPACT Learning Framework’s alignment to developmental, neuroscience-based and other learning theories be further articulated and updated so that it maintains its currency. School of Education and Professional Studies, 2017.